Description of decorations: Fine sand, gravel and small to medium sized pebbles. Description of equipment: AQUAEL TURBO 1000 x 2, JVP 101 cyrkulator – 3000l/h, LED 10W x 2. Water parameters: Temperature 26°C, pH 6,5, conductivity 186 µS/cm. 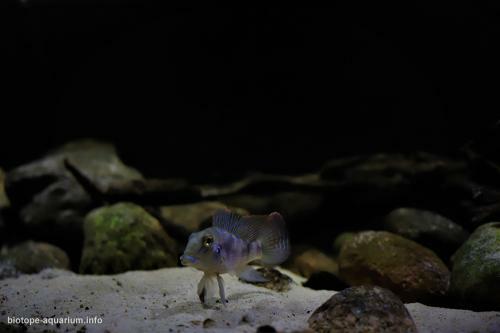 Description of the area surrounding the biotope: The aquarium has been set up to reflect a fragment of Rio Tocantins bank, below Tocantinópolis in Brazil. The tank houses a small group of wild Retroculus lapidifer. 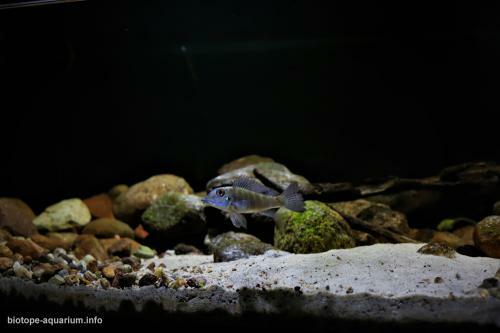 The tank represents a sand and gravel fragment of the river bed which is frequented by these cichlids in the nature. 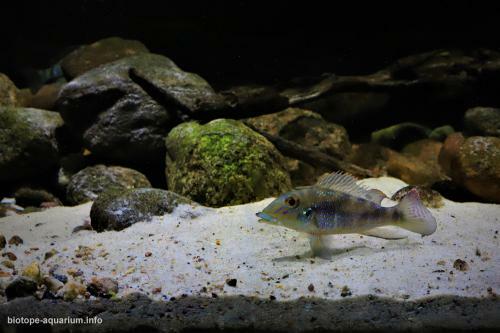 The tank is relatively low for cichlids that can grow up to 30 cm in length, but they have been found in water as low as 20 cm in the nature. These cichlids are believed to prefer sandy areas but for breeding they create nests up to 60 cm diameter made of small and medium sized pebbles and rocks, with which they are provided in the tank. Description of the underwater landscape of the biotope: The underwater landscape consists of both open sand banks, gravel beaches as well as intermediate areas with enormous rock formations. Depth varies, but Retroculus have been found in water as shallow as 20 cm. Description of the parameters of the habitat: Temperature 22-27 °C, pH 6,5-7,5. List of fishes and invertebrates occurring in the nature biotope: Cichlidae – Rondonacara hoehnei; Retroculus lapidifer; Laetacara araguaiae; Cichla kelberi; Cichla piquiti; Caquetaia spectabilis; Characidae – Acestrocephalus stigmatus; Tetragonopterus denticulatus; Tetragonopterus araguaiensis; Serrapinnus aster; Serrapinnus lucindai; Rhinopetitia myersi; Pseudopimelodidae – Microglanis xylographicus; Microglanis oliveirai; Rivulidae full species; Crenuchidae; Melanocharacidium auroradiatum; Poeciliidae; Phalloceros leticiae; Pamphorichthys araguaiensis. Threats to the ecology: The main threat to all fast flowing rivers in South America is dam construction. 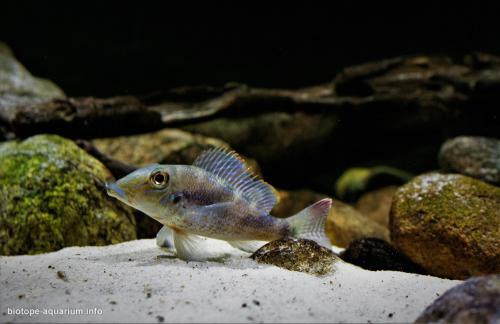 Dams destroy natural habitats for the majority of rheophilic fishes, such as Retroculus.